WASHINGTON (April 08, 2009) -- Congressional staffers got a chance, April 8, to interact with Soldiers from the 3rd Infantry Regiment (The Old Guard) and fire a weapon often used in operations, the M-4 carbine. The event was an Army Weapons Day on Capitol Hill. In the Capitol Hill Police firing range in the basement of the Rayburn House Office Building here, more than 300 staff members from congressional and committee offices tried on Soldier body armor, looked through night-vision scopes, and fired 10 shots on the M-4 carbine individual Soldier weapon. Members of the 3rd Infantry Regiment (The Old Guard), from Fort Myer, Va., and staff members from the offices of members of Congress, participated in an "Army Weapons Day," April 8, on the firing range in the basement of the Rayburn House Office Building, Washington, D.C. Members of the Old Guard instructed congressional staffers on how to safely fire the M-4 carbine. After a safety briefing, staffers were given the opportunity to fire 10 rounds into a target and to then have their target scored. While firing, they were chaperoned on the range by a Soldier from the Old Guard. "It was fun," said Meredith Liberty, from the Office of Oversight and Government Reform. "I didn't do very well -- I only got 41 out of 100 -- but I shot his (the target's) arm off." The staffers were given a standard target used by members of the Capitol Police that features "suspect" profile and were asked to fire 10 shots. Participants were given points based on how they did, and later in the evening, were invited to attend a social event where the best shooters were given prizes and all participants and Soldiers could enjoy pizza and beverages. Jeff Champagne, a staffer for Congressman Ron Klein of Florida, had shot weapons before. He said he's fired 22-caliber weapons, in addition to 12-, 16- and 20-guage shotguns. He also was able to participate last year in a similar event where he fired the M-4 carbine. This year, he said, he scored 100 points on the target. "It was a solid group," he said, adding that he scored better this year than he did the last time the Army held the event. "Last year I feel like it wasn't calibrated for me," he joked. Garett Donovan, one of Champagne's coworkers, has also done some shooting and scored a 91 on the target, though he did say he's never shot with an M-4 before. "Outside of the clay pigeons, 22s and stuff like that -- never an M-4 though," he said. "You get a little more respect for the equipment -- you feel it in your shoulder." Spc. Kevin Redman, a military policeman with the 3rd Infantry, was on hand at the firing range to demonstrate Soldier equipment to civilian participants. "I was showing them the night-vision goggles that attach to the helmet, basically trying to show them how it works and what you do with it -- we drive with it and shoot with it." Redman said he thinks interacting with Soldiers will give the civilian participants a new perspective on the Army. "I think civilians have a general understating of what Soldiers do -- but maybe not the physical side of it, like the equipment and wearing the gear," he said. Redman's counterpart, Spc. Jeff Madden, also a military policeman, agreed. "Hopefully they just see a different side of things, to see what the Soldiers are doing and to know what is going on out there," he said. 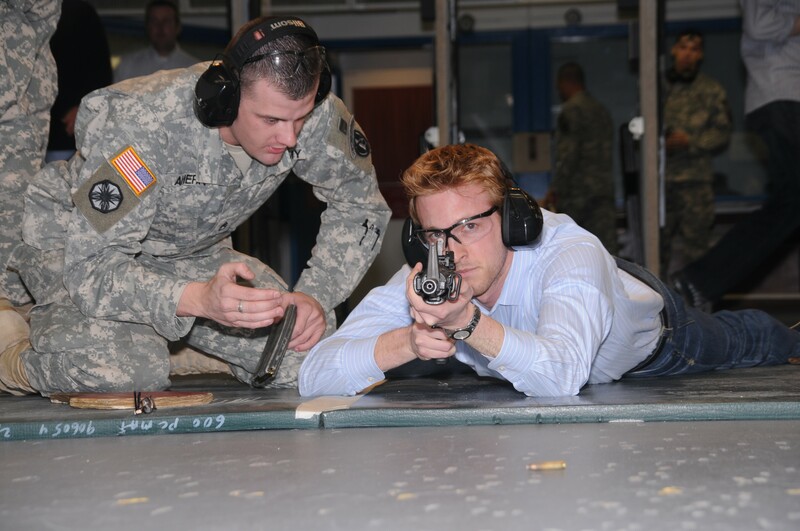 Col. Chris Hughes, director of the Army's congressional liaison office on Capitol Hill, said helping congressional staffers learn more about the Army is exactly the purpose of the day at the range. "It gives them a chance to talk with young Soldiers who are very professional," Hughes said. "And it's about how professional those Soldiers are that are coaching them through that. They will learn who my guys are, learn a little bit more about the Army and they are a little more comfortable coming to talk to us." Hughes' office is responsible for helping members of the Army communicate with members of Congress, and also for helping members of Congress communicate with members of the Army. His office also helps congressional offices answer constituent questions about the Army. Last year, the colonel said, his office assisted in more than 47,000 inquires from constituents to members of Congress. By providing some exposure to the Army for congressional staff members during events like Army Weapons Day, Hughes said it makes it easier for both his office and the offices of members of Congress to do their jobs. "For them to know who we are, for us to interact with them, and for them to get exposed a little bit to the Army, makes answering those constituent questions easier and more efficient," Hughes said. "On Capitol Hill, it's all about building relationships."